A failure to deliver Brexit would be "a catastrophic and unforgivable breach of trust in our democracy", Prime Minister Theresa May has warned. Writing in the Sunday Express, Mrs May said the Commons vote on her Brexit withdrawal deal would be the "biggest and most important decision that any MP of our generation will be asked to make". 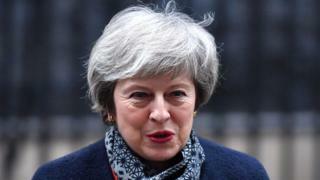 The PM is widely expected to lose the vote on the withdrawal agreement she reached with the European Union, something some ministers have said will lead to Brexit "paralysis". Mrs May said: "When you turned out to vote in the referendum, you did so because you wanted your voice to be heard. "Some of you put your trust in the political process for the first time in decades. We cannot — and must not — let you down. BBC political correspondent Chris Mason said one possibility was that backbenchers could legally compel the government to delay Brexit beyond the set departure date — a proposal some MPs have already called for. But critics — including both Brexit supporters and opponents — say that leaving without a deal would be a disaster for the UK: driving up food prices, leading to shortages of goods and gridlock on some roads in the South East resulting from extra border checks.